Alien life-forms, bumblebees, and dinner | Grow. Cook. Read. Write. Spring is showing signs of sticking around. The bumblebees are always one of the first signs that there will be warmth again soon. When I first moved to the Northeast, and saw those zeppelins flying around, I was terrified. I thought people were feeding bees steroids. (They might live in Florida, too, but I never saw one there.) I could only obsess about how it would feel if one of those suckers stung me. Now, I’m always ecstatic to see them. And that loud, humming buzz makes me smile. How could I not love such an ungainly, enthusiastic creature? 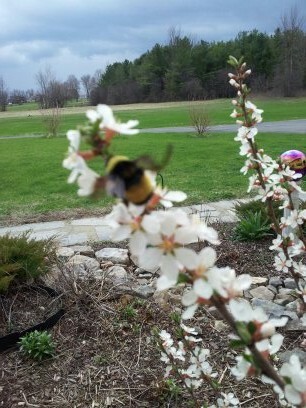 I was thrilled to see two of my favorites–Nanking cherry blossoms and a bumblebee–in front of the house the other day. 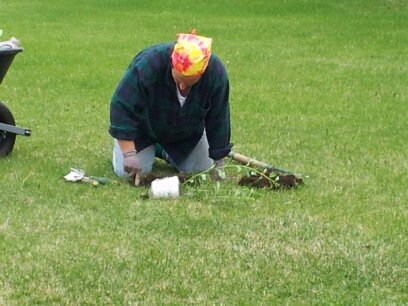 The planting continues, with a Gala apple, two Montmorency cherries, a Seckel pear, two high-bush blueberries, and an assortment of ornamental shrubs. One of them, speaking of enthusiasm, is a forsythia. Ohhh, that yellow! I read a very respected gardener’s opinion of forsythia early last winter; she called them gaudy, among other things. To that, I have one thing to say: pssshhhttt. Whatever. I might like bright colors. I might also not care too much about matching when I’m gardening. If this next phase of my life isn’t working out financially, my fashion sense indicates that I could always be a clown, no? But here’s hoping that this next phase includes cooking for others, and doing tasty farm-to-table things. 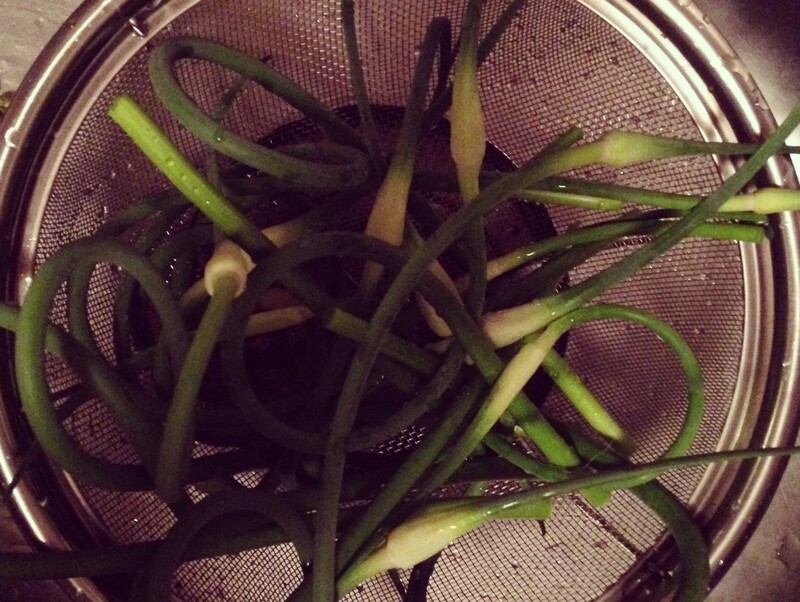 A recent, simple recipe that we had is something I’d be happy to pay for in a restaurant. 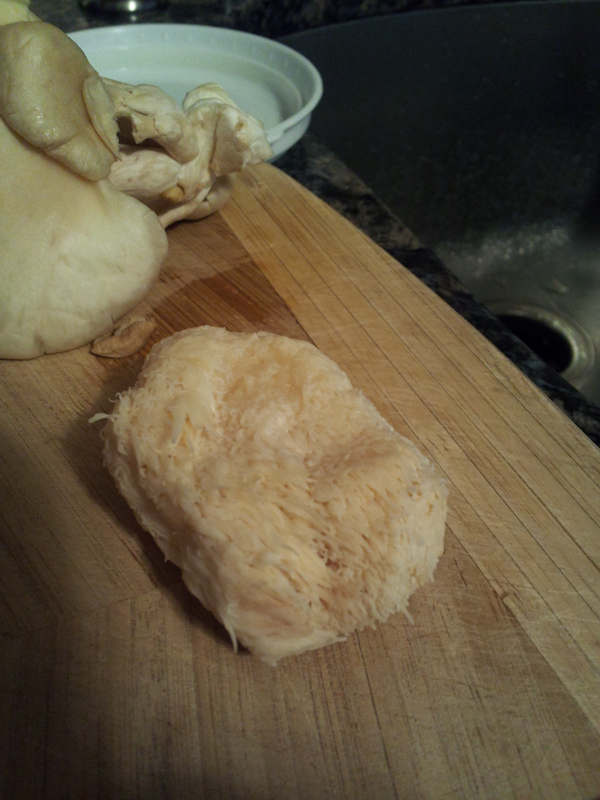 It involved a lion’s mane mushroom, which I had never seen before last week, when we got our CSA share. We had one lion’s mane, one oyster, and one large shitake. The lion’s mane is definitely one of those, “So, who do you think first looked at that and thought ‘Hey, I bet that tastes good! '” foods. I had to look it up, because I was sure someone had made a mistake and given us an alien life-form. But, nope. It turns out that they hold a ton of moisture, and it’s wise to squeeze that out (yes, squeeze away…it can take it…just don’t wring). I took the blogger’s advice and sliced the mushroom thinly, then seared it in olive oil and butter. After searing it and the oyster mushroom pieces, I set them aside and slow-cooked an onion with some red pepper flakes. 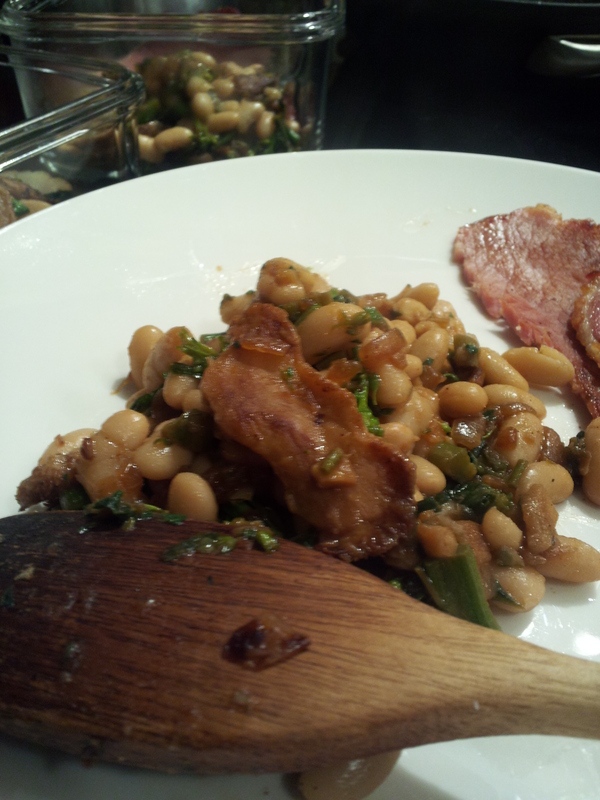 I tossed in a rinsed can of cannellini beans, some salt and pepper, and towards the end, I wilted in some spinach. If my husband wouldn’t have protested his lack of dinner, I would have eaten the whole pan myself. Simplicity in a skillet, and so delicious. The lion’s mane was a little chewy, the oyster mushroom was meaty, and there was a lot of savoriness to the dish. I might actually seek those crazy looking things out, next time I’m at a grocery store.